Here's a happy holidays greeting from Thunder Butte, belated in posting only because I was away for the holidays. It comes from Harley and Monika Zephier who have a very nice website displaying their native American artwork, Owl Tipi Art (click here). 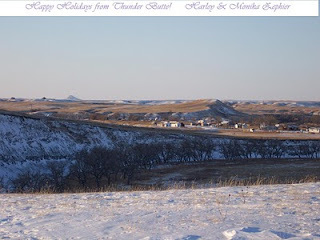 I believe that the card shows the snow-covered village of Thunder Butte on the Cheyenne River Sioux Reservation, with Thunder Butte -- the butte -- seen in the distant left center of the photo. The scene is stunning in its beauty. I encourage you to visit Harley and Monika's site, Owl Tipi Art, where you can find an online exhibition of some of their Dakota/Lakota art, obtain information about upcoming exhibitions throughout the area, and support their continued efforts by purchasing some of their very lovely native American artwork.